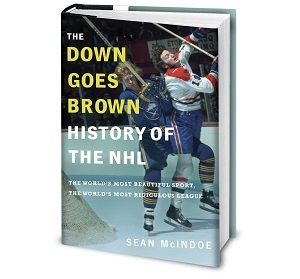 Down Goes Brown: Fade to black. Roll credits. Have you ever watched a movie with a tacked on ending that doesn't work with the rest of the story? It feels wrong, like it was from a different film, and it ruins the whole experience. And then sometimes you get the other side of the coin. The ending that just fits, that nails the tone of the story exactly. An entire storyline summarized in one perfect scene. Last night was one of those perfect endings. There's no better single scene you could choose to describe this Leafs season than Kessel's back-breaker goal: a younger, faster opponent breaking in to score, while a Leaf trails behind him, not skating hard, complaining to the officials. That's what this team has become. They don't work hard. They don't skate. And they always find somebody else to blame. It's a tribute to this team's core leadership that a young player like Kronwall can come up, play only a handful of games, and still know exactly how to handle the situation. His reaction was right about of the Bryan McCabe playbook. So the good news is, the Leafs 2007/8 movie ended perfectly. The bad news is we'd already seen it -- twice, in fact. Damn sequels. And I hear that Peddie Productions are already working on another one. After all, the critics hate them, but they make a killing at the box office. Who knew Bryan McCabe was so eloquent a speaker?